Dutch painter and designer, member of a family of artists. He was the son of a Leiden regent and c. 1550-60 went to Antwerp to study with Frans Floris. From c. 1565 until his death he worked in Leiden, except for a brief interval in 1573-74. From 1576 he was a member of the city council and between 1586 and 1607 was alderman on 13 occasions and burgomaster of Leiden 5 times. In addition, he was active as a painter of narrative pieces and portraits and was also a designer of prints, stained-glass windows, silver, seals and wall hangings, most of which work was commissioned by the city of Leiden and his fellow regents. 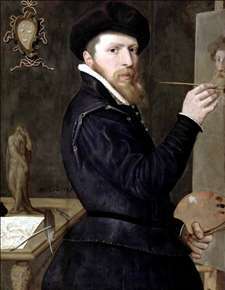 His Self-portrait (1568; Stedelijk Museum De Lakenhal, Leiden) is one of the most important north Netherlandish self-portraits of the 16th century and bears evident traces of his training in Antwerp. In his later portraits a more provincial style emerged. Between 1594 and 1612 van Swanenburg produced seven large paintings, the Old and New Trades for the Saaihal (Serge Hall) of Leiden, six of which survive (Stedelijk Museum De Lakenhal, Leiden). Two are allegories on the prosperity of the textile industry; the four others show various phases of textile production. The series is an important example of the depiction of trades in Dutch art. Among the many stained-glass windows executed to his designs are two monumental windows in the St Janskerk, Gouda, the Siege of Samaria (1601) and the Liberation of Leiden in 1574 (1603). Isaac van Swanenburg had many students, including Otto van Veen and Jan van Goyen. Three of his sons became artists: Jacob van Swanenburg (1751-1638)and Claes van Swanenburg (1572-1652) were both painters, while Willem van Swanenburg (1580-1612) practised as an engraver. 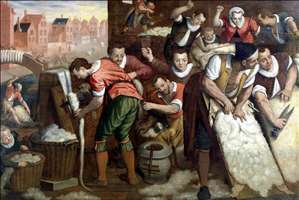 See more details about "The Removal of the Wool from the Skins and the Combing"